Hi! It's Jilly. 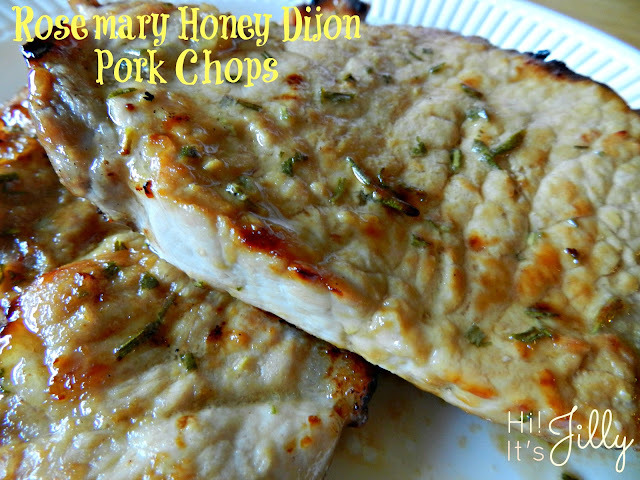 Need a great pork chop recipe? This one is quick, easy, AND delicious! It's my go-to recipe for pork chops. It is a variation of a lamb chop recipe I found in Our Best Recipes from Better Homes & Gardens. 1. Preheat broiler. Arrange chops on unheated rack of a broiler pan. In a small bowl, stir together mustard, honey, and rosemary. Spread some of the mustard mixture on top of the chops. 2. Broil chops 3 inches from the heat for 6 minutes. (It might take less, depending on how thick your chops are.) Turn chops over; spread remaining mustard mixture onto the chops. Broil for 6-9 minutes more, or until desired doneness. The original recipe has you broil 2 zucchini, cut lengthwise, at the same time as the meat with the mustard mixture on top, too. I haven't tried it, so I can't vouch for it. But, I bet it would be awesome! I hope your family loves these as much as mine does!